Angry over the elevation of Brett Kavanaugh to the U.S. Supreme Court, some customers and tourists vow to stay away from the state and its products. People upset with Sen. Susan Collins’ support for now-Justice Brett Kavanaugh are calling for a boycott of Maine products and tourism. “Dear Susan Collins – I really struggled with this but my tourist $ just voted against ever visiting Maine while you remain in office,” actor and comedian John Fugelsang tweeted out to his 413,000 followers – a megaphone in the shouts and murmurs of the Twitterverse. John Fugelsang’s tweet, which has since been deleted. Hundreds of people said in the comments that they were behind the boycott, including one person who canceled a $2,200 reservation at Point Sebago resort and a Texas chef with multiple restaurants who vowed to boycott all Maine seafood. Others discussed shifting their travel plans to New Hampshire or Vermont. One Maine lobster dealer says he has lost a few customers over the issue. Collins, a Republican, was under unprecedented pressure from both advocates and opponents in the weeks leading up to her vote Saturday to confirm Kavanaugh. On Friday, she gave a lengthy speech about why she was supporting him, prompting the backlash as she finally said publicly how she would vote. When she returned to Maine over the weekend, protesters assembled at her home in Bangor, her offices in Bangor and Portland, and at the Portland International Jetport. Even so, Collins said that the response of Mainers had been “overwhelmingly positive” in the hours after she voted to confirm Kavanaugh. “Many people have thanked me for my vote and have said that they were very pleased that I did the right thing,” she said Sunday after an event in Norridgewock honoring a slain sheriff’s deputy. Sen. Susan Collins, R-Maine, talks to journalists after speaking on the Senate floor in favor of U.S. Supreme Court nominee Brett Kavanaugh on Friday. On Monday, it appeared there were still so many calls to her office that messages couldn’t be left, and the website was down at one point for maintenance. A staff member at Collins’ office said it was closed for the federal holiday, which may have contributed to the voicemail system filling up. 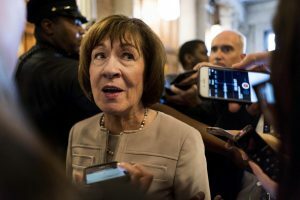 Collins’ spokeswoman, Annie Clark, did not respond to a request for comment Monday on the calls for a boycott triggered by the senator’s vote. John Tesar, who owns six restaurants in Texas and is opening a seafood restaurant in Laguna Beach, California, said he’ll re-source the “hundreds of thousands of dollars” worth of Maine seafood – including lobster, fluke, sea urchin and scallops – that he buys every year. Maine has faced boycotts in other politically charged times. Early in 2017, L.L. Bean was boycotted after the Federal Election Commission reported that family heir Linda Bean, known for her support of conservative causes, violated federal election rules by giving too much money to a political action committee she bankrolled in favor of then President-elect Donald Trump. The company pushed back, saying it wasn’t involved in politics and Linda Bean, while a board member, didn’t speak for the company. On Monday, some of the people commenting on Fugelsang’s tweet about boycotting Maine products in response to Collins’ vote specifically mentioned L.L. Bean. A spokeswoman for the company did not return calls for comment. In 2016, after Gov. Paul LePage left a profanity-laced voicemail on a lawmaker’s phone, there was a flurry of “boycott Maine” concerns amid worries about LePage’s outbursts and the national attention that followed. Massachusetts lawyer Sandra Lundy said Monday she’s serious about boycotting the state – and she’s telling everyone she knows to do the same. Lundy, who has a law firm in Brookline, said she usually comes to Maine once or twice a year to hit the outlets with her daughter and visit the state. No more. Some Maine defenders say the boycott is ill-advised, pointing out that it hurts working Mainers and, besides, the state’s other senator – independent Angus King – voted against Kavanaugh. Many states, they note, had both senators backing Kavanaugh. Karu did not return calls seeking comment. Economic boycotts range from highly organized, even state-backed efforts, to force change through sanctions, to more casual and impulsive demands. Among the most well-known economic boycotts are the Montgomery Bus boycott during the civil rights movement, boycotting California table grapes for farmworker rights in California and the boycott of tuna fish that led companies to change fishing methods to produce “dolphin-safe” tuna. The Change.org site is peppered with petitions calling for boycotts, and boycotts are a common tool of both liberal and conservative causes. More recently, Trump has called for boycotts against companies that have considered moving operations out of the United States, swearing off Oreos (“I’m never eating Oreos again,” he said on the campaign trail) when Nabisco announced plans to close a Chicago plant and move it to Mexico. In August, he backed a boycott of Harley-Davidson, when it considered moving production to Europe to avoid the impact of the president’s steel tariffs. 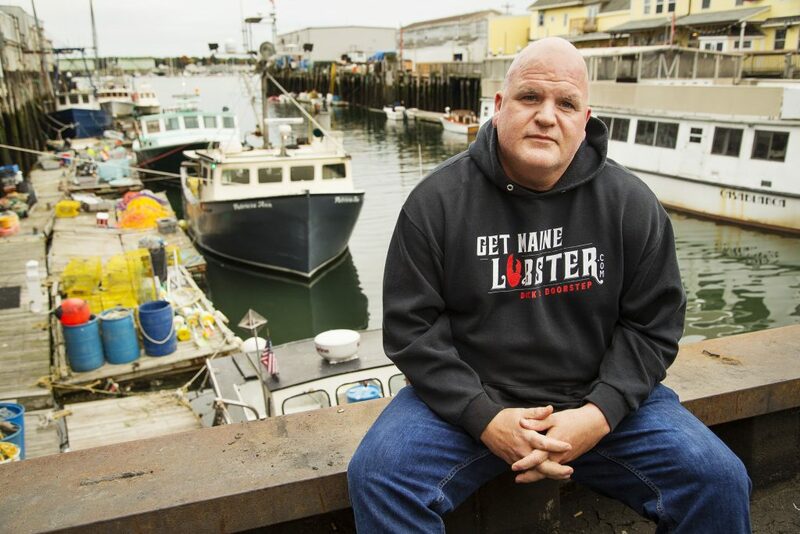 Mark Murrell, owner of getMainelobster.com, said several customers canceled their orders because of Collins’ vote, forcing him to call them and try to get their business back. “I’ve loved your product the two times I’ve ordered so far. However, due to Senator Collins I can no longer support products from Maine. I hope you can let her know,” one customer wrote in an email to Murrell. In fact, Murrell said he did write Collins a letter – but before her final vote Saturday and before that customer canceled the order. As a businessman, he said he tries to keep out of political issues since he has customers all over the country of various political beliefs. But he felt he had to write her after her speech Friday signaling her support for Kavanaugh. “One of the things our elected officials don’t ponder enough is the ripple effect of their voice. It needs to be a consideration,” Murrell said. This story has been updated at 11:14 a.m. on Oct. 9 to provide a screenshot of a deleted tweet.